Who is looking to try a new workout plan?? 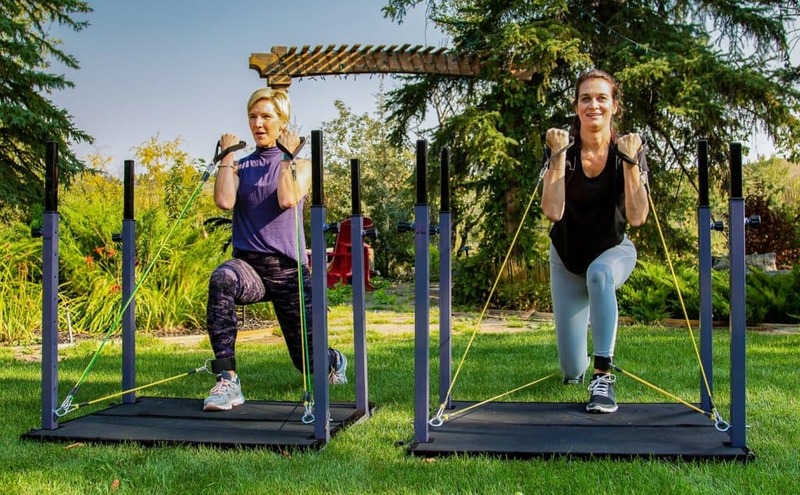 At the beginning of September, Christine and I had the pleasure of going through a new workout regime with Evolution, a home gym unlike any other. Vu from EvolutionVN approached us after finding us on Instagram (@mojoandmoxie), of all things, and asked if we would like to collaborate with him and see what his home gym and workout entails. 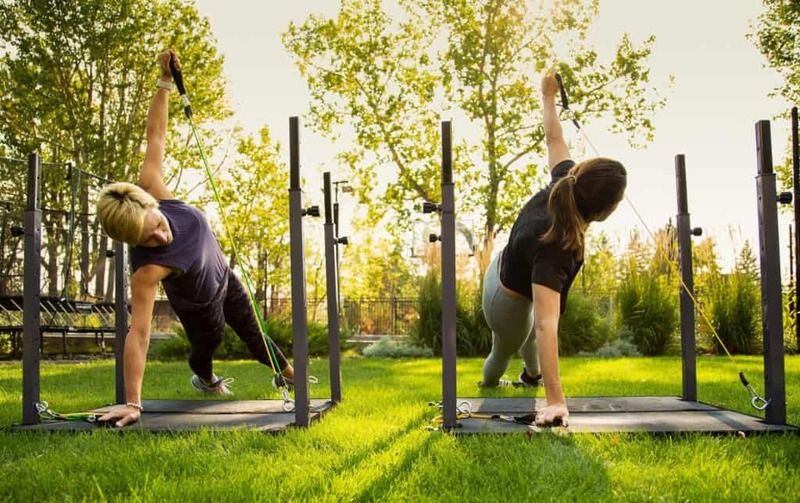 Christine and I are strong believers in wellness and fitness, although different in our approach, whether it is a cardio workout, weights, yoga or just a long walk. Christine likes the intense cardio and weights and I am a yoga flow, less cardio person. So we jumped at the opportunity to see what the Evolution had to offer and if it appealed to all types and levels of fitness. Motherhood is busy whether you are a new mom, mom of mid aged children or moms on teenagers. It never seems to stop. There is school prep, and activities to drive to and always trying to figure out what the next meal is going to be. Exercise may not be on the top of your priority list, and for some, finding time to fit it in isn’t always easy. But you can get a pretty crazy good workout in just 20 minutes – which is just what we found with the Evolution. We happened to pick a perfect summer morning in September to get to it!! Vu put us through a workout that worked for both of us. This is the beauty of the Evolution because it is so adaptable, you can go at your own pace with the resistance that works for you. There are so many allowable modifications to get a great workout in. Christine and I are at different levels of fitness but both felt the benefit of the workout. One of the fundamentals of training is a push up and many ladies find it hard to do a full push up, therefore we modify from our knees. Using the resistance bands and belt on the Evolution allows for that extra hand to help with a full body push up. You can then modify the bands as you evolve and gain strength. 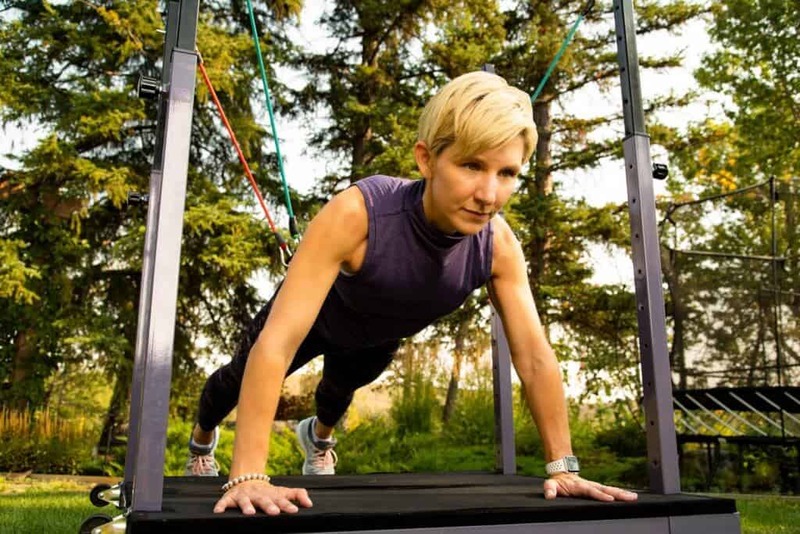 Evolution home gym even allows for some resistance in your yoga flow. Grounding yourself with a tree pose is hard enough for some to balance but add some resistance to it and then you have just lifted your yoga practice to a new level. To be quite honest, Christine and I did not know what to expect going into this workout. At the end of it, we can say we actually loved it!! Vu has a great training philosophy and as two busy moms that happen to be over the age of 40 😉 .. the 20-30 minute (our even as quick as 10 minutes) works into our daily schedule. This Guest Blog is written by Christine and Danni aka Mojo and Moxie . Christine and Danni started a blog for mothers. But specifically, mothers of teenagers. Having gone through the trials and tribulations themselves, they hope to impart some of that wisdom. The blog was born from a desire to include the more established woman in the blogging sphere. They wanted to create a template that was relatable to a family that is starting to face the challenges of kids leaving the nest, “big kid issues,” aging, and the excitement / trepidation of this next stage. With backgounds in communications and holistic nutrition between us we wanted to share what we know AND what we don’t. "Our musings are simply our own observations and Mojo vs. Moxie is dedicated to each of us taking a stance on an issue. Sometimes it might be something we are personally dealing with, or something that might come up in this next stage of life. Hang out – enjoy and feel free to comment and subscribe. We hope to keep you entertained and informed and provide a little laughter along the way." Be sure to follow their journey for awesome Mama Tips!